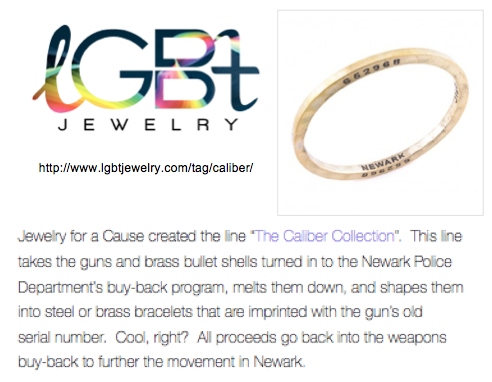 Jewelry for a Cause is honored to be mentioned by the Huffington Post as the hopeful trend in the gun-inspired direction fashion is taking. 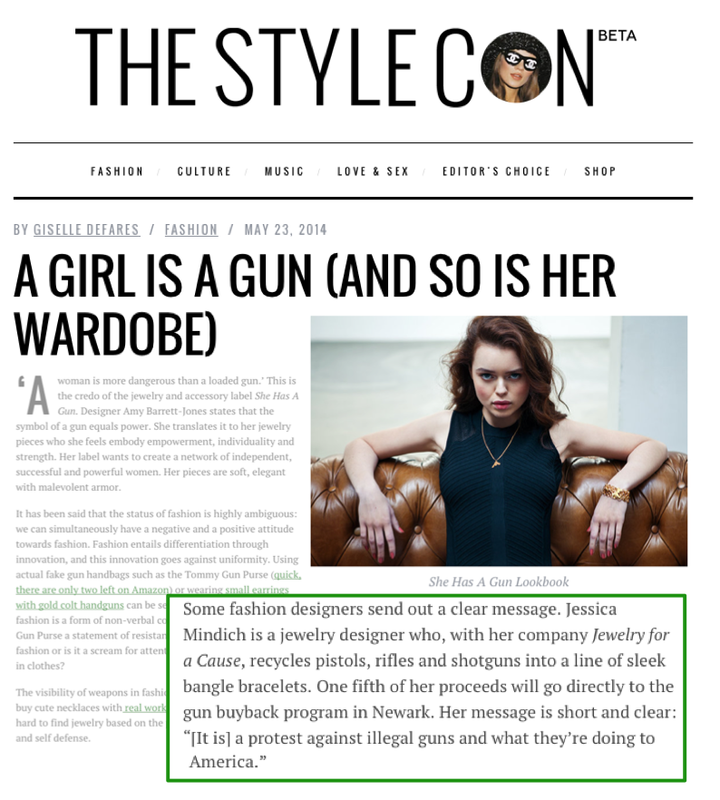 Check out the article Fashion Keeps Embracing Guns, While Guns Keep Killing Women by Katy Hall. The Style Con’s Giselle Defares highlights the “power” of fashion. Kristin Meekhof picks us as one of her Top 8! 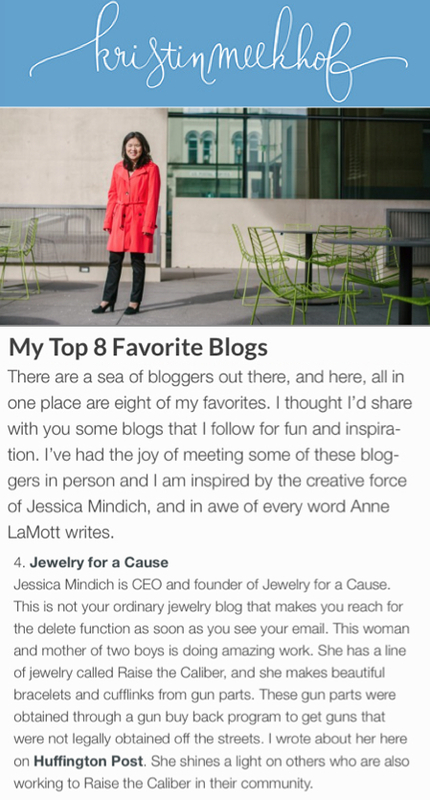 Kristin Meekhof picks the Jewelry for a Cause blog as one of her TOP 8 favorite blogs along with Second Firsts, a blog reaching out to women who are on the widow journey; Footsteps, a single mother to adult children, giving practical advice on parenting, writing, organizing finances and being a grandparent. Women Run is a single mom’s blog who runs her own business, her children to events, a households and races. Cup of Jo is a blog about travel, design, food, relationship, fashion & beauty. As well as blog about a family’s current journey adopting a daughter from China; This is Me Being Real. Along with Anne LaMott, a best-selling author who’s blog is about her struggles with anxiety and self-doubt, and Dr. Mark Hyman who writes for the Huffington Post about healthy living. What a line-up of amazing blogs, we are privileged to be featured with them! 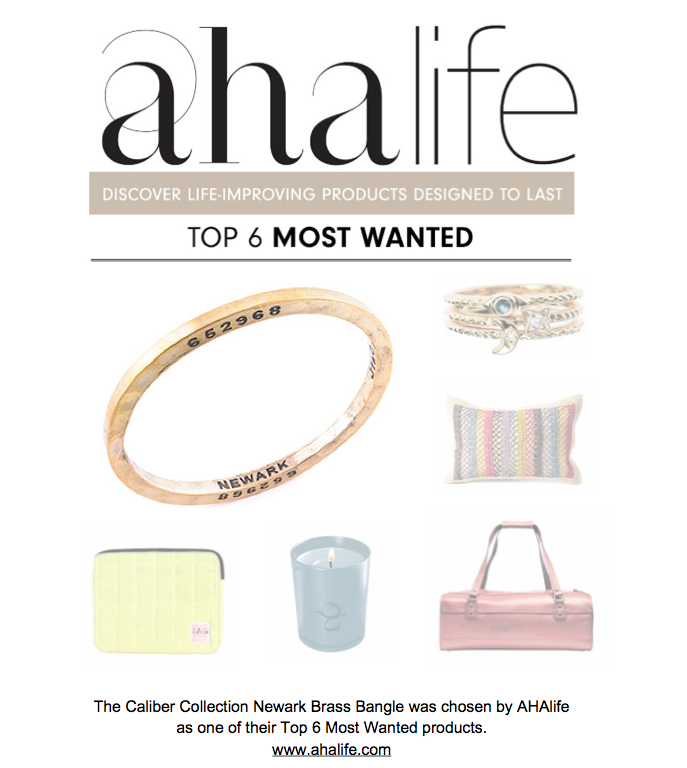 The Caliber Collection Newark Brass Bangle was selected as one of the TOP 6 most wanted products for AHAlife last week, alongside some amazing products that give back to charities and organizations around the world! Nomi Network’s quilted laptop case gives all their proceeds to help human trafficking survivors. Pillows from Mar Y Sol are constructed from renewable materials special to Madagascar giving the native women economic independence and promote environmental conservation. Candles, designed by Alexa Rodulf exclusively for the Ricky Martin Foundation, give a portion of the profits from each sale to protecting and raising awareness for children’s rights all over the world. All the proceeds from the sales of the Rachel Roy and Deepak Chopra stackable rings are donated to the Chopra Foundation. The British duo, Elivs & Kresse’s overnight bag is made from reclaimed fire hose, taking 50 percent of proceeds and giving them to the Fire Fighters Charity. We are honored to be featured with these fabulous companies! Check out these products at http://www.ahalife.com. Gretta Monahan, Style Guru on the Rachael Ray Show mentioned Jewelry for a Cause as what she’s loving this May!